58 acres on lower Eld Inlet (Mud Bay) in Thurston County, 2 miles from Olympia. Estuarine habitat, tidal sloughs, freshwater springs, and forested uplands with 1.25 miles of coastal shoreline and 51.5 acres of classified wetlands. Also, in-stream habitat for five salmonid species, as well as shoreline habitat for waterbird and wetland habitat for landbird species. The property is the southernmost terminous for McLane Creek into Puget Sound, an important stream for salmon habitat. The Lower Eld Preserve is located along the eastern shoreline of lower Eld Inlet (Mud Bay), not far from Capitol Land Trust’s Randall Property. The Lower Eld Preserve has 1.25 miles of shoreline on Puget Sound, 40½ acres of wetlands, and 14½ acres of forest. McLane Creek, famous for its hearty salmon runs, flows through the property and into Puget Sound. The vegetation on the Preserve consists of saltmarsh and wetland emergent grasses near the shoreline, and native coniferous and hardwood forests. Common species in the forested areas include Western red-cedar, Western hemlock, Douglas-fir, Sitka spruce, Pacific madrone, Pacific dogwood, big leaf maple, red alder, and a variety of shrubs including evergreen and red huckleberry, Oregon grape, salal, thimbleberry, salmonberry, and snowberry. The Preserve provides intact habitat for five salmonid species: Eld Inlet fall chum; Puget Sound/Strait of Georgia coho; Puget Sound fall chinook; native Puget Sound winter steelhead; and anadromous coastal cutthroat trout. Large numbers of juvenile salmonid smolts produced in McLane Creek use the waters along the property for feeding and transitioning to life at sea. Forage fish species (Surf and Longfin smelt, Sand lance, Pacific herring, Pacific sardine and Northern anchovy) use this location as well. Numerous waterfowl, shorebird, waterbird and landbird species also take advantage of the the property’s unique coastal habitat. This Preserve also contains a mineral salt deposit which is an important source of nutrients for the Band-tailed pigeon. The Band-tailed pigeon is identified as a priority game species in Washington, and a Bird of Conservation Concern by the US Fish and Wildlife Service. Approximately 350 Band-tailed pigeons visit the property in early morning every day from late June to September. There are fewer than 100 documented mineral sites in Oregon and Washington frequented by pigeons. 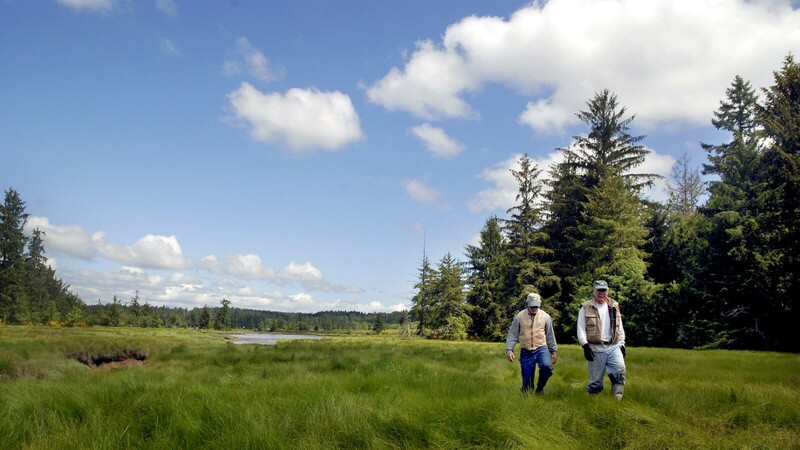 Acquisition of the Lower Eld Preserve is part of a larger, strategic effort to conserve highly functional coastal wetland habitat within the Eld Inlet watershed. To date, Capitol Land Trust and more than 30 agency and nonprofit partners have conserved more than 600 acres and 6 miles of marine shoreline habitat spanning 17 individual sites within the watershed. Capitol Land Trust wishes to thank all the project partners, especially the former landowners, Anderson & Middleton Company, for their willingness to partner with us on this project. In addition, we are grateful for the generous funding support from a National Coastal Wetlands Conservation Grant administered by the US Fish and Wildlife Service and Washington Department of Ecology; a Salmon Recover Funding Board Grant administered by the Washington Recreation and Conservation Office; and private contributions from Taylor Shellfish Farms, Squaxin Island Tribe, and Capitol Land Trust members and supporters.